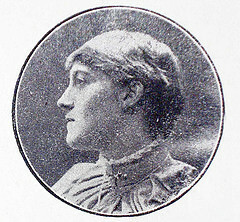 The poet and writer Elizabeth Gibson, (Elizabeth Gibson Cheyne, 1869-1931) described herself as a socialist, a suffragist, and a freethinker. Her writings from the years before the First World War touch on the different kinds of violence created by social inequality and injustice. She began by being antiwar, and in December 1914 was among those suffragettes who signed an Open Letter to the Women of Germany and Austria. But as the war continued she became more conservative and nationalistic. This is a brief selection of aphorisms and poems from her earlier work. ‘War is a business of innumerable personal tragedies’: Wilfrid Gibson, Elizabeth Gibson Cheyne, and the First World War. War poems by Wilfrid Gibson (Elizabeth’s brother). Few oppressors realise that the foregone result of oppression is revolution. The millionaire is responsible for the bomb-throwing of the Anarchist. Restore, O empires, your sword-stolen possessions, that the peoples need not resort to violence to restore their lands. Insurrection comports with liberty, and rebellion with peace. One bought a foot of land in a far land with the lives of many men, and his country counted him a hero. Wars would cease if every soldier recognised that he was a murderer. True patriotism is a burning shame for our country’s injustice and wrongdoing. Patriotism is selfishness, universalism is humanness. He alone is free who is creedless and without nationality. To help him hunt, and fall ourselves a prey. To fight against a foe. And mine at evening gathers in the herds. We shall return no more. With greedy warfare’s crimson clout. To rot on battle’s awesome fen. The nations rear their heads in pride. Is holier and higher far. To swell some monarch’s slaughter-feast? A horrid mass of butchered dead. To build, to clothe, to feed. In sea-girt England pray and toil. For any tongue, or any pen. For I am your everlasting Redeemer. And, in those years, thou wilt die millions of times, for want of the healing wisdom, that is written in the book of peace.